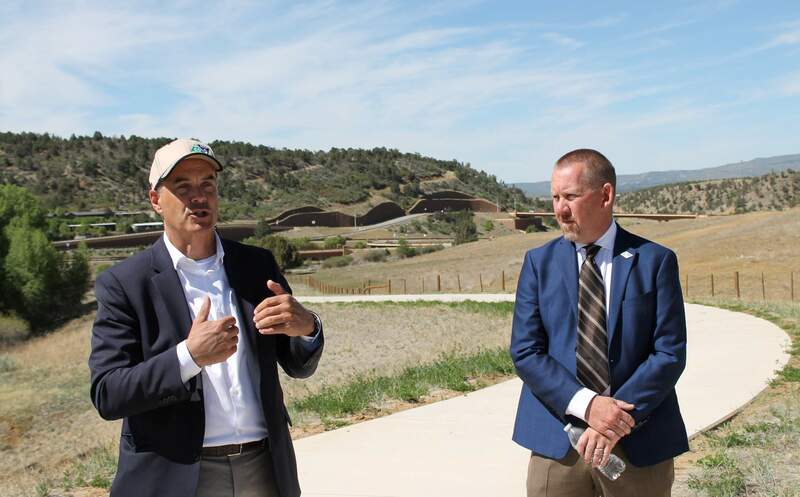 Colorado Department of Transportation Executive Director Mike Lewis and CDOT Region 5 Transportation Director Mike McVaugh talk about future plans to realign U.S. Highway 550. The Colorado Transportation Commission gathered Thursday near the bridge to learn about the project as part of a tour of the state. Work to connect the Bridge to Nowhere with U.S. Highway 550 could start in 2019, state highway officials say. The $99.6 million realignment of the highway will eliminate Farmington Hill, a steep and dangerous section of road. The new 2-miles of highway would include four lanes (two in each direction) and a de-icing system on portions of the road. 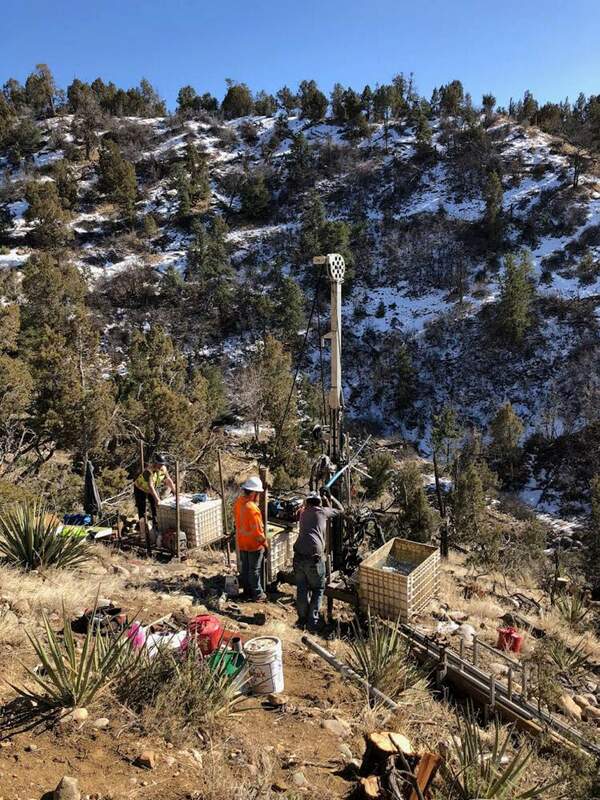 Crews started soil sampling this winter in preparation to design the new stretch of road, said Mike McVaugh, transportation director for Colorado Department of Transportation’s Region 5. “It is happening even though you can’t see the wheels turning,” said Sidny Zink, Colorado Transportation Commission chairwoman. Colorado Department of Transportation Commission Chairwoman Sidny Zink, CDOT Executive Director Mike Lewis and CDOT Region 5 Transportation Director Mike McVaugh talk about future plans to realign U.S. Highway 550 to connect with the Grandview interchange. The Colorado Transportation Commission gathered Thursday near the bridge to learn about the project on a tour of the state. Zink of Durango addressed her fellow commissioners Thursday near the so called Bridge to Nowhere, also known as the Grandview interchange. The commission stopped in Durango as part of a statewide tour. The board approved spending $54.4 million on the project, and additional funding will come from state, federal and local sources. “I think this is a perfect example of success when we all work together,” said CDOT Executive Director Mike Lewis. Funding for transportation across the state is tight, he told the group. Colorado needs $10 billion to fund transportation, but it only has funding to cover 20 percent of those needs, he said. Voters could see a citizen-initiated question on the November ballot to increase funding for statewide transportation projects, Lewis said. If a question is not posed in November, voters will consider a ballot question in 2019 that would ask them to approve $2.337 billion in debt to fund transportation, according to recently approved Senate Bill 1. In this area, U.S. Highway 550 is in need of $30 million to widen the road from County Road 302 to Sunnyside Elementary School, McVaugh said. The project could be a good candidate for grant funding, he said. Geotechnical drilling and sampling was done just south of the Grandview interchange, also known as the Bridge to Nowhere, this spring. The samples will be used to help design and construct the future realignment of U.S. Highway 550 to connect with the interchange. In recent years, CDOT and local governments made significant investments in the Grandview area in anticipation of the realignment. The $47 million interchange, which includes the Bridge to Nowhere, opened in 2011 and includes a network of four bridges and large retaining walls. 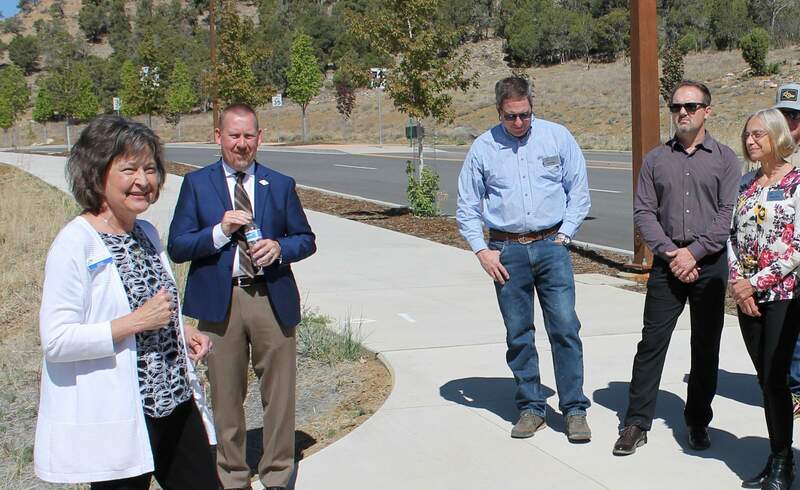 The city of Durango, La Plata County and CDOT spent $9.8 million on Wilson Gulch Road to connect the Grandview interchange to roads in Three Springs subdivision. It is anticipated that Wilson Gulch Road will one day serve large retail stores in the Grandview area. The Southern Ute Growth Fund has seen more interest in developing new retail stores in the area recently, said Pat Morrissey with the Growth Fund’s real estate group. The fund is approved to build 256,000 square feet of big-box retail stores. “Three Springs has great momentum right now,” he said. Green lights ahead for Highway 550 realignment with ‘Bridge to Nowhere’?